Detailed Engineering (on the basis of customer's / collaborator's / consultant's basic engineering) of most of the technological plants & machinery as well as utilities. Turnkey jobs, including system design, for fuel oil / tar installations, gas mains, burner front pipe work train for any fired equipments like furnaces, boilers, kilns, BF stoves, combustion system & metalling pre heater for hot air (900°C) blast for mini blast furnaces, etc., complete ladle heaters, tundish heaters, combustion system for hot mixer, drier for moist granulated slag, lime calcination plant, dolomite sintering plant, waste heat recovery systems, combustion & control systems. Design, manufacture, supply & installation, if required, of unfired pressure vessels, Combustion System (burners), recuperators, fired heaters, preheaters, super heaters, heat exchangers, etc. Technological fabrication & erection of carbon steel & alloy steel materials. Detailed engineering, inspection, refractory laying and / or refractory dry out & preheating of any large refractory installations. Storage tanks, out flow suction heaters, strainers, mat heaters, line heaters, phs. Petroleum act, explosives formalities. 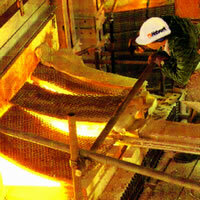 Hotwork is the pioneer of the convective heating process, which simplifies refractory dry-outs and heat-ups. The one-sided drying of monolithic refractories is an extremely complex transient heat and mass transfer phenomenon which includes chemical reactions throughout the dry out. Moisture trapped in a refractory lining after a furnace or vessel rebuild is especially detrimental to optimum refractory performance. Network's convective heating method utilizes rapid heat transfer at all temperature levels. Our patented burners produce high velocity combustion, which is accurately controlled from ambient to temperatures in excess of 2500°F (1370°C). This high discharge rate circulates the products of combustion evenly throughout the vessel, regardless of size and configuration, producing overall temperature uniformity. The process results in fast, even moisture removal across the entire refractory lining allowing rapid furnace startups. Hot work has been tremendously popular in the field of "REFRACTORY DRY OUT" and has numerous equipment to match its work endlessly. We have a special designed set of "HIGH VELOCITY BURNER" to completely remove moisture during the dry out process. 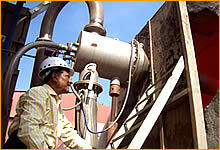 Traditionally, small to medium-sized glass furnaces in the Asia Pacific region have been heated-up in 7 (or more) days. This has become widely accepted as the “norm”, and it is perceived that a faster heat-up will result in an abbreviation of the eventual furnace campaign life. This is a misconception. There is no technical reason why the refractories generally used in container and lighting glass furnace construction can not be heated up more rapidly. The only inhibiting factor is being able to adjust for, and control, furnace expansion. (Exceptions would be where Dense Chrome blocks and “M” (fused alumina) Crowns are present.) By using the High Velocity burner system, there is no need for such a cautious approach. Your furnace can be safely heated-up from ambient to 1100/1200oC over a 3 or (maximum) 4 day period. This provides a substantial saving to you in terms of furnace downtime. 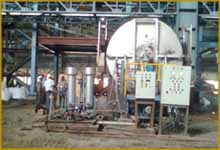 Over 100 furnaces have been heated-up in India & Abroad over the past 12 years, by (briefly) commencing combustion air reversals from the beginning of the heat-up, thereby pressurizing the furnace and optimizing temperature uniformity throughout, and using High Velocity burners to heat-up in 3 or 4 days (depending generally on the furnace size). The results show no measurable difference in subsequent furnace campaign life versus furnaces which have been heated up over a schedule twice as long. WHY HAVE YOUR FURNACE SITTING IDLE FOR 3-4 DAYS LONGER THAN NECESSARY ? Hot work's unique draining service allows draining rates up to 40 tons per hour per tap. Furnaces at or below grade can be quickly drained using our high-pressure water pumps, which allow a 2-meter lift, and pipe runs in excess of 70 meters. 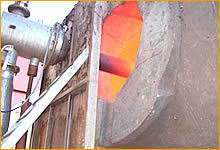 Hot work offers fast cullet filling systems capable of up to 60 tons per hour. 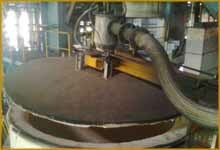 We offer the original "dry" filling equipment where air is used as the medium for conveying the cullet out into the furnace for quick melting and elimination of thermal shock to the fill pockets plus systems to filter out fines or wetting equipment to eliminate the dusting of the superstructure. Hot work uses special outlet nozzles in conjunction with our unique Hotwork burners to quickly and safely remove sulfates and borates from checker settings to allow the furnace to operate at or near original design parameters. 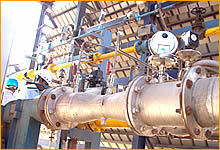 By using advance modern High Velocity Burner System with the best advance method. By using sophisticated light- weight Drilling Machine, High Pressure Water Pump & appropriate drained Glass Conveying System. Furnace Control Cool Down – Applying modern method & Equipment. For Furnace Inspection & Ceramic Welding to enhance the Life of Furnace with the international proven technology. Furnace Hot Repair – With the guidance of Hot Repair Specialist from abroad. Experience/ Specialization of SPECIALIST is enclosed. 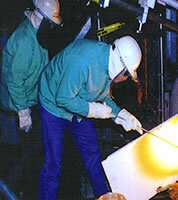 Crown repairs to melter, regenerator, ports, using hot insertion refractory or casting. Burner block replacement / Thermal couple block replacement. Tweel stone / crutch arch replacement / canal assembly change - out. Checker pack unplugging / checker change - out. Water shut off gate fabrication / installation. Waist area - rebuilding stirrer grid, arch replacement. Training of personal for day to day furnace preventive maintenance. Regenerator Decongestion – by using advance modern High Velocity Nurner System with the best advance method. Furnace Drilling/Tapping/Draining- by using sophisticated light-weight Drilling Machine, High Pressure Water Pump & appropriate drained Glass Conveying System. Furnace Control Cool Down- applying modem method & Equipment. Furnace Hot Repair- With the guidance of Hot Repair Specialist from abroad. 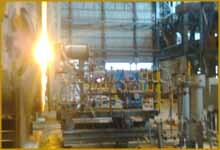 Glass furnace & metallurgical furnace design are available through M/s Jack Furnace design. Batch house design along with various equipments. Design modification for existing Furnace. 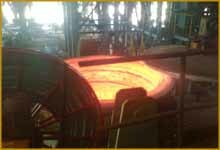 Torpedo ladle heating system are in operation with the appropriate specialized Combustion Equipment along with moveable trolley at various Steel Plants.